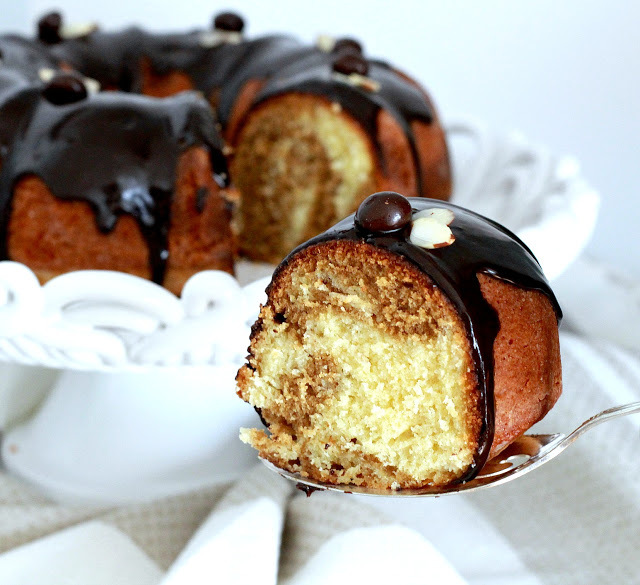 Oh, I wish you were here with me for a slice of this Coffee Marbled Bundt Cake with Dark Chocolate Ganache. Swirls of yellow and coffee infused cake with a decadent dark chocolate ganache. I made this as a birthday cake but so good anytime. 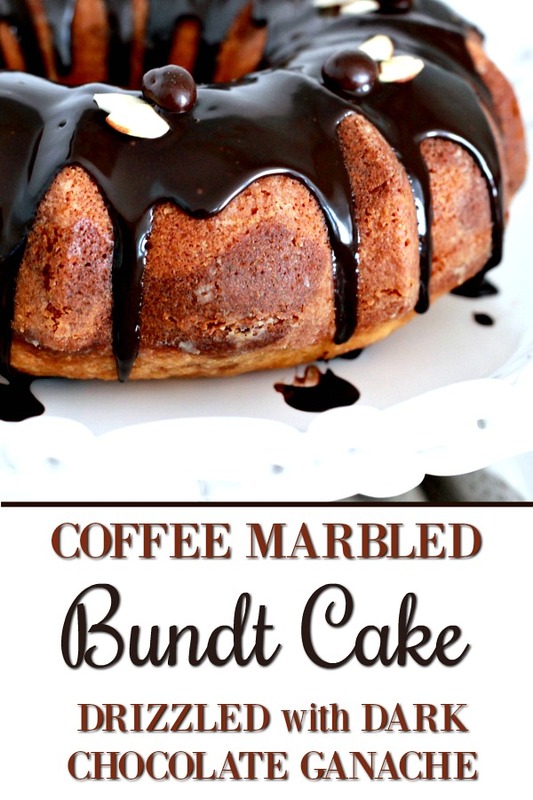 The darker part of the marbling is swirls of cake flavored with coffee liqueur. 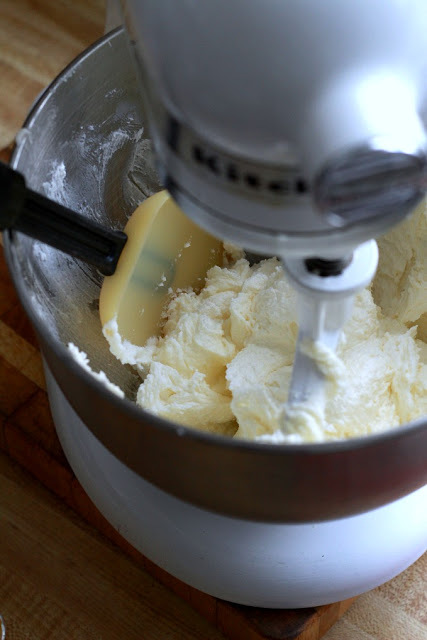 Gather all the ingredients to make baking go smoother. 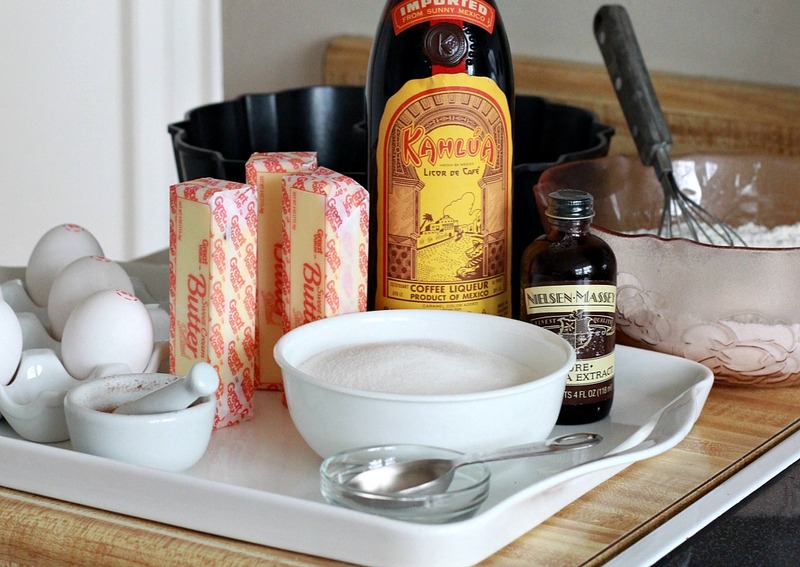 In a medium bowl, combine the espresso powder and liqueur; set aside. 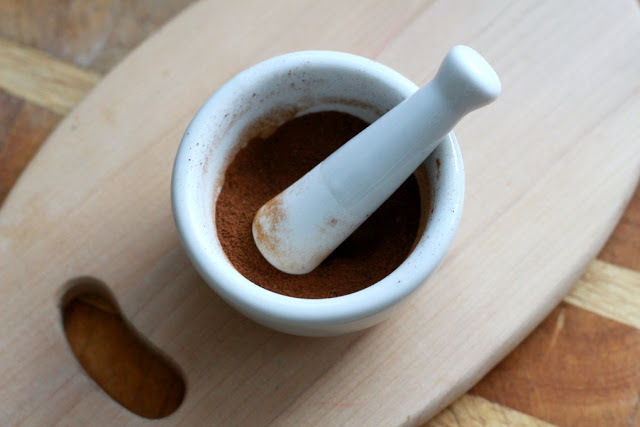 TIP: I made espresso powder by grinding instant coffee with a mortar and pestle. 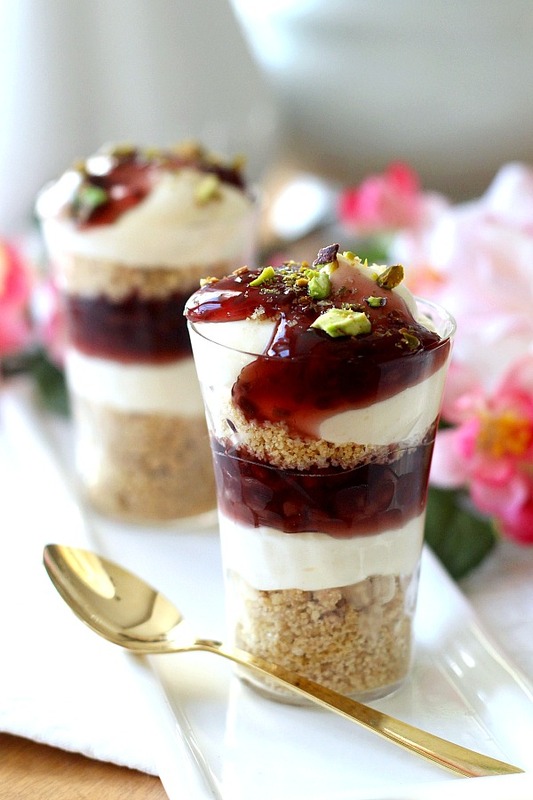 If you don’t have one, use the back of a spoon to press the granules until powdery. 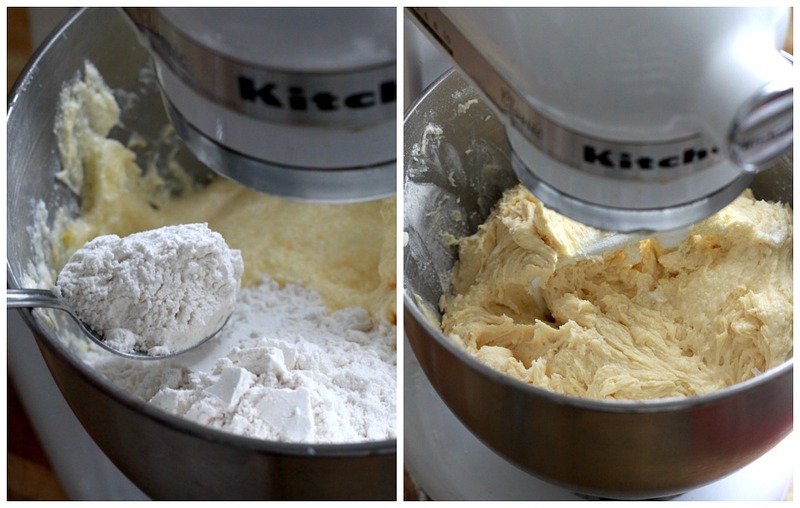 Whisk the flour, baking powder, and salt in a large bowl until well blended. Add butter to bowl of mixer fitted with the paddle attachment; beat on medium speed until well blended and smooth, about one minute. Add the sugar and beat on medium high until fluffy and lighter in color, 2 to 3 minutes. Add the eggs, one at a time, beating briefly after each addition. Add the vanilla and the egg yolk. Stop to scrape down the bowl and the beater as needed. Add half of the flour mixture and with mixer on low speed. fold in until well blended. Add the remaining flour mixture and fold in until well blended. Spoon about half of the batter (about 2 1/2 cups) into the espresso mixture and fold until well blended. 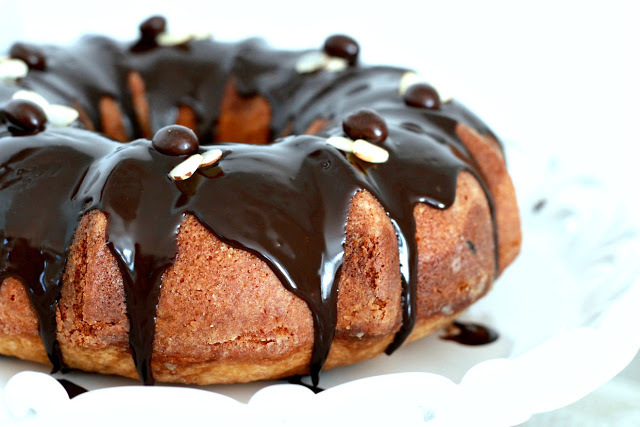 Lightly spray or grease and flour the bottom and sides of Bundt pan. 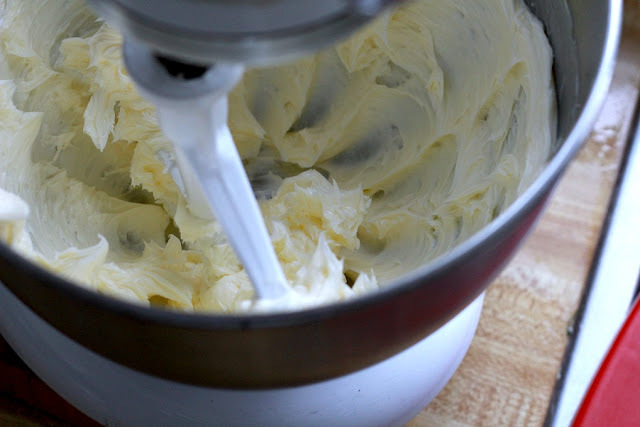 Using a large spoon or scoop, alternately add a large spoonful of each batter to the prepared pan, working around the pan to cover the bottom. You should have four mounds of each batter. 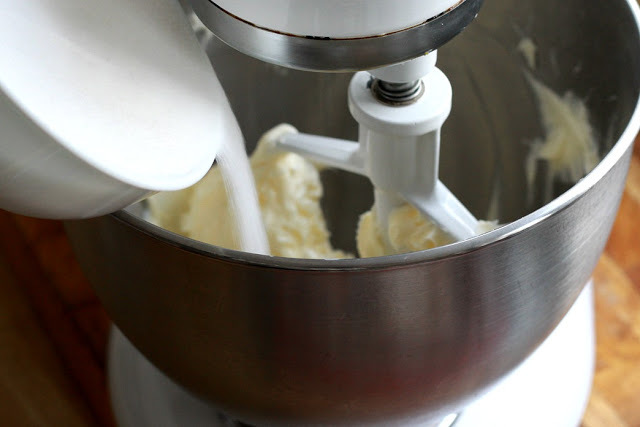 Repeat with the remaining batter to form a second layer, alternating the batters and beginning with a scoop of vanilla batter on top of the coffee scoops. 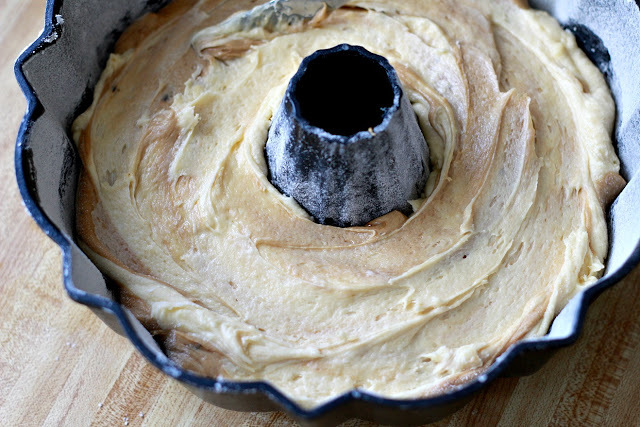 Using a knife or narrow spatula and without scraping the sides or bottom of the pan, drawl it through the batter to swirl. Smooth the top and gently tap the pan on the counter a few times to settle. Bake until a pick inserted in center comes out clean, about 55 minutes. Place cake on a rack and let cool for 20 minutes. Invert the cake onto a rack, lift off the pan and let cool completely. Add the chopped pieces of chocolate and the cream to a small microwave-safe bowl and microwave in 30 second intervals, whisking between each, until chocolate is melted and mixture is smooth. Set aside until no longer hot. Perfectly timed post. Yesterday I bought a bundt pan on clearance at HomeGoods. Thanks! I love your blogs. 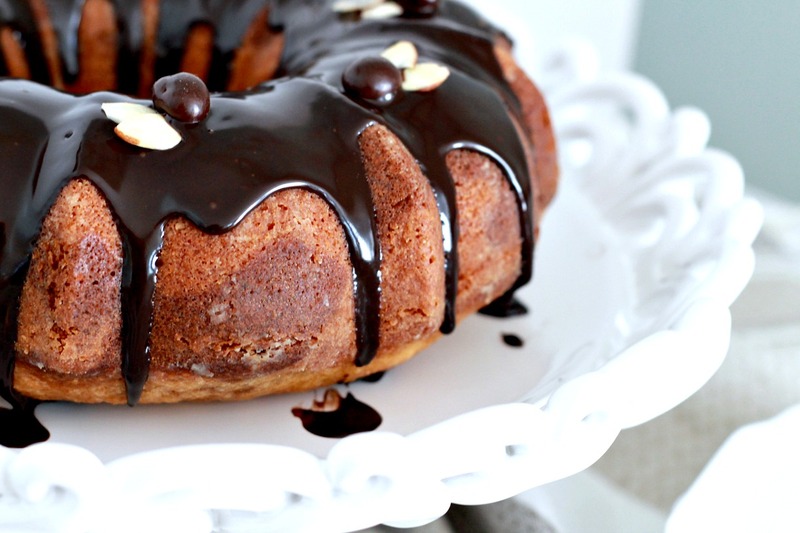 This looks like a phenomenal cake. Thank you for sharing and birthday prayers and blessings for the two grandads. 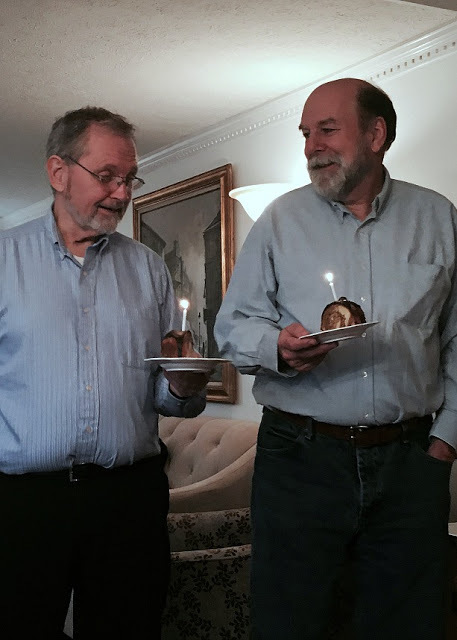 Belated birthday wishes to Poppy and Pop Pop! The cake looks delicious; I've never had anything exactly like that but I KNOW I would love it! Ooh, this looks delightful – my two favorite flavors – chocolate and coffee. Happy Birthday to Poppy and PopPop.